The Trump administration has taken an early step in renegotiating the North American Free Trade Agreement, sending Congress a draft list of priorities that expresses hope for change in a broad range of areas. Now Congress will be involved in revising that list. The Trump administration has taken an early step in renegotiating the North American Free Trade Agreement, sending the U.S. Congress a draft list of priorities for the negotiation that expresses hope for change in a broad range of areas. Now Congress will be involved in revising that list. 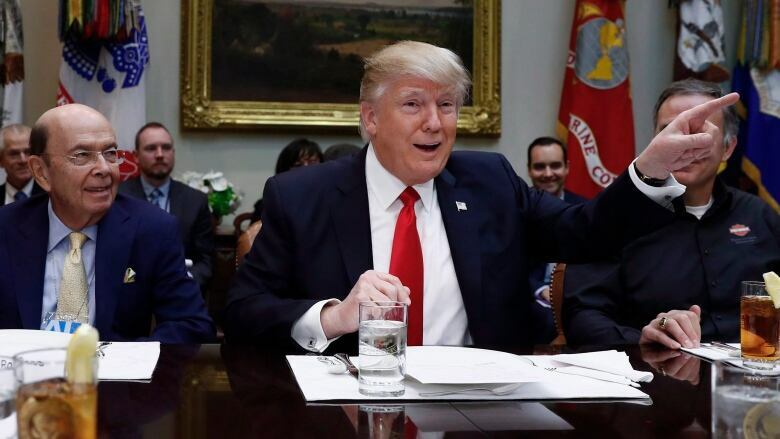 Then the administration will issue a formal notice that it wants to renegotiate the deal and spend a minimum of 90 days consulting lawmakers and industry, meaning formal talks with Canada and Mexico could begin in the summer or fall. This preliminary consultation is required under the so-called fast-track law that allows trade deals to pass Congress with a simple majority and an up-or-down vote, with no amendments. The letter includes vague references to making changes in a number of areas, including agriculture, government procurement, tax policy, intellectual property, rules of origin for things like car parts, telecommunications and dispute resolution. It also suggests a mechanism to impose tariffs if imports flood in and threaten U.S. industry. "The persistent U.S. deficit in goods trade with Canada and Mexico demands that this administration take swift action to revise the relationship and respond to 21st century challenges," said a copy of the draft letter, obtained by The Canadian Press. "Most chapters are clearly outdated and do not reflect the most recent standards in U.S. trade agreements." Some U.S. media interpreted the Trump team's draft as mild. A Wall Street Journal headline said: "Trump administration may seek only minor adjustments to NAFTA." When asked about that Thursday, White House spokesman Sean Spicer stressed the policy was not yet final. The letter does avoid the more strident anti-NAFTA language of Donald Trump's campaign rhetoric and actually refers to the importance of the trade bloc. Signed by the interim U.S. trade representative, it says: "Our shared borders also mean shared goals, shared histories and cultures, and shared challenges." Yet it hints at important changes — seemingly more significant than the minor "tweaking" the president referred to when he met Prime Minister Justin Trudeau last month. Levelling the playing field on taxes. This appears to be a reference to countries refunding value-added taxes for products exported to the U.S. The practice occurs with numerous trade partners, particularly Mexico, but also with Canada and the GST. Expanded opportunities for agriculture. Members of Congress have made it clear they'll push the administration to pry open Canada's protections on dairy and poultry imports. A permanent mechanism that would threaten tariffs as a response to a flood of imports. Rules of origin that promote U.S. jobs and production. This could have a significant impact on the auto sector. The big question mark: Will the U.S. seek a "Made In North America" approach for car parts, and target Asian imports — or a more restrictive "Made in America" approach that targets the neighbours? "My assumption is that it will be at least the former — (Made in North America)," said Alan Wolff of the U.S. National Foreign Trade Council. More access for telecommunications, a heavily regulated sector in Canada. Public procurement. That's another big question mark, and a timely one given Trump's intention to spend $1 trillion on infrastructure. On the one hand, the letter refers to expanding opportunities for U.S. suppliers, which suggests a more open approach; yet, on the other, it refers to more restrictive policies consistent with the administration's Buy American philosophy. Eliminating Chapter 19's countervailing and anti-dumping provisions — which have helped Canada fight punitive measures on softwood lumber. The letter promises to work closely with Congress: "We commit to work with you (in Congress) throughout the process," said Stephen Vaughn, the temporary U.S. trade representative. And that's where things get more complicated. Canadian-American trade lawyer Mark Warner said it's too early to draw conclusions about how simple, or how elaborate, the talks might become on the basis of this single draft letter. He says Congress will want to toughen it: "I expect bilateral irritants will be pushed to be included by Congress," Warner said. Trade-policy adviser Peter Clark says it looks like a standard opening gambit — he said the priorities listed appear similar to those of any previous U.S. administration in a trade negotiation involving Canada. "My initial take is: 'They needed to elect Trump to do this?"' Clark said. "It's pretty routine stuff. It's an opening position." The TPP is dead, so what does that mean for Canada?